We are in the middle of the Blood Moon Tetrad. It has been said that lunar eclipses are not unusual but that four consecutive Blood Moons (Tetrad) that fall on God's feast days are quite rare and always have significance for Israel. Solar eclipses, on the other hand have significance among gentile nations. The total solar eclipse will occur on March 20, 2015 and be visible in Northern Europe. It will not be seen over the Western US. It happens on the Jewish New Year for KINGS. Interestingly enough a strong Solar storm is bombarding the earth at this writing (March 17, 2015) and the Northern Lights are being seen well below the arctic circle. 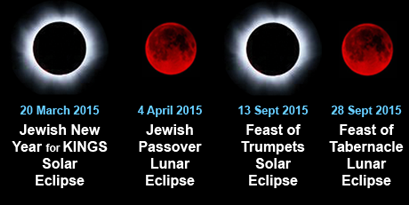 Do these events mean that the Messiah is going to return on this date? I think not. Could it have no significance at all? That is possible, but I doubt it. Israel is having their elections today but the results might not be known for several days who the actual winner is. Pray for the peace of Jerusalem. Could it be significant for Northern Europe, where the eclipse will be seen? We'll find out in three days. Blessings on you as you watch and pray.